Starbucks has changed their position on allowing patrons to bring guns into their establishments. Citing that they want to give customers a ‘safe and comfortable respite from the concerns of daily life”. In other words, they will support the second amendment so long as it doesn’t hurt their sales! I was very happy to hear that they were standing up for our constitutional rights, now I am very disappointed that they, like every major corporate interest, have placed profits above people. Is this the way we fight for our rights? ACTION: Place your comments to the Starbucks CEO Howard Schultz to this post. We will forward all comments directly to Starbucks. Starbucks has requested that customers leave their firearms at home, shifting company policy amid an increasingly fractious debate over US gun rights in the wake of multiple mass shootings. Chief Executive Howard Schultz said the request is being made in part because more people have been bringing guns into Starbucks over the last six months, prompting confusion and dismay among some patrons and employees. No more Starbucks!! Where I go, my gun also goes!!! I have a CC and it looks like I’ll be buying my coffee at McDonalds from now on. 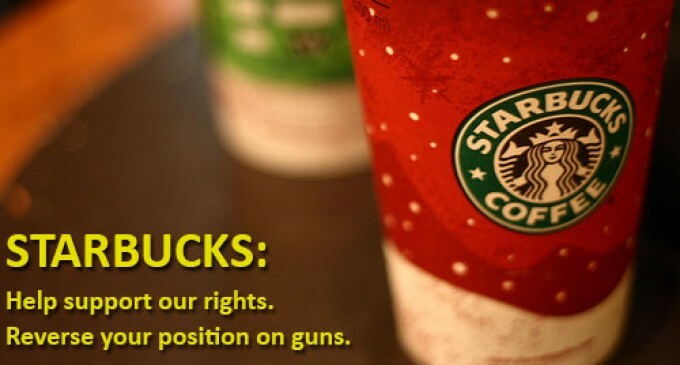 Their coffee may not be as good but, they respect my 2nd amendment rights and the fact that I can carry a CC weapon. Legal gun owners seldom cause trouble. Since there are no plans for Starbucks to provide armed security at their stores I will continue to take advantage of my constitutional rights and purchase my coffee at Dunkin Donuts. How about a scheduled weekend to boycott a certain Mainstream Media a weekend at a time? 10 million viewers inexpensive way while sitting down making a dent to force start them to make inquiries like the scandals esp Benghazi; if not ,just a protest and displeasure. Now criminals will now know that they can rob SB because they don’t allow ccw on there property.